I've mentioned once or twice in these little advertising tirades of mine that we all live in the future now. And while I do enjoy my personal hovercraft and my regular Pan Am flights to the moon, I feel that it's important to take a step back and remember the good things of days gone past. Like Transhuman Space Classic, for example. See how it has the word "classic" in the title? That means its old and really good. It's also about the future, which dovetails nicely with my theme. 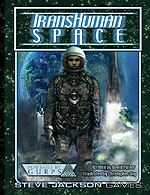 If you're unfamiliar with it, Transhuman Space is basically what would happen if you took Future Shock, cranked it up to 11, and made an RPG out of it. Awesome, right? Well, now it's available as a PDF! Tonight, Randy will be gaming at The Rusty Scabbard in Lexington, KY from 5-9pm. For Randy's complete itinerary, check out our Where's Randy? page.